At the heart of the York Rally is the programme of rides – that’s what cycling is all about. We are proud to host rides run by numerous local and national clubs and organisations, as well as some led by generous volunteers. Do please contact our Rides Co-ordinator Gary if you, or your club, could lead or organise a ride! This page lists rides from the 2018 Rally, ranging from family friendly pootles to evening pub rides to all-day adventures into the Yorkshire Moors and Dales. 6.30pm: York Greenways evening pub ride with fish & chips on the way! Leader Peter Huxford says “Pub Ride with Fish and Chips, along the Solar System Greenway and quiet country lanes. Lights needed.” Approx 7 miles each way, route here. 7:40 PM: Evening pub ride to the Carlton Tavern, Holgate, York. Short ride to this nearby (less than two miles away) pub. As with all evening rides, you MUST be equipped with working lights. Leader is Malcolm Carline. Route online here. 8:50am – ‘A’ ride. Destination Fridaythorpe, approx 61 miles, fast/medium pace – leader Lynn Bland. Estimated return 2pm. View the route online here. 9:00am – ‘C’ ride: Easingwold, 41 miles, medium pace. Estimated return 2 pm. Leader: Gary Knighton. 9:00am – 100k Audax ride. The classic York Rally Audax route, 100k+ up into the Howardian Hills and back (mapping shows it is actually 114 km / 71 miles in total). Estimated return 3:40pm. Route here. £7.50 entry fee. Enter in advance please via the Audax UK website – numbers are limited but entries on the day will also be possible if spaces remain. 9:20am – ‘E’ ride. Slow/family ride to Riccall, where the Methodist Hall will be open with refreshments from 10 am to 1 pm. 19 miles, estimated return 1:30 pm. Leader TBC or may be self-led (ask for a map at HQ). 10am: York Greenways/Sustrans super easy “Eco” family ride to Naburn “Traffic free eco ride to Naburn along the Solar System Greenway with stops to see York’s unique iridescent Tansy Beetle habitat and Urban Buzz’s wild flowers. Mid morning coffee and cakes at Brunswick Organic Nursery Café. 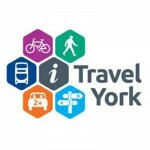 Visit www.yorkgreenways.org for more info and video.” Under 4 miles each way. Route here. 11:00am – “Boost Your Confidence” women-only ride. To Clifton, just 3.5 miles each way. Return approx 2 pm. Easy and very beginner friendly! 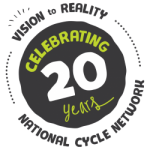 Leader: Jacqueline Mountford-Green..
11:30am: York Greenways/Sustrans slightly longer ride This will be on the ‘Way of the Roses’ going to the National Trust’s Beningborough Hall, 9 miles each way – largely traffic free but with a couple of miles on road. The start is timed to be there for lunch, return around 3:30PM. Route map here. 1.30pm – RSF Ride – off road. Destination Dunnington & beyond – leader Rob Newton. About 20 miles using cycle tracks, bridleways and quiet roads. Route here. Estimated return 4:30pm. 6pm: “VV” pub ride – mostly traffic free. Out only, about five miles. Destination: Blacksmith’s Arms, Naburn. Leader: Howard Yeomans. Details here and route here. 8:45am – Church service ride to Naburn. Mostly traffic free. An all age worship service will take place at St Matthew’s, Naburn, at 9:30 AM. There will be a marshalled ride back after the service. Route here. Gather opposite Rally on cycle path across the horseracing track – see map in programme. More details and pictures here. Leader Paul Reid. 10.00am – RSF Ride -off road – destination ‘Pluto’, Riccall – leader Geoff Smith. About 8 miles each way. Route here. 11:30am: Café Cycling Ride to Naburn (self led). Join a leisurely jaunt down the Greenway to explore the cafes of Naburn – possible destinations include the shop/cafe at Brunswick Organic Nursery, the Naburn Station Trust Hut and the cafe at Naburn Marina. Maps provided.” Route here. 12:15pm – York Greenways/Sustrans Velodrome ride – Ride to York’s new Sports Village, where we hope to see bsome action on the velodrome. 5 miles or so each way. Route here. Route back is along the Foss Island Greenway via St Nicks Environment Centre. All York Greenways/Sustrans rides listed are led by a trained ride leader. All children must be accompanied by a responsible adult. Riders will be issued with a map of the route and will have the option of spending more time at any of the attractions visited. This page will be updated regularly with the latest details. Thanks to Ride Social from British Cycling and Sky Ride for running rides!